As Venus nears its square to Chiron (exact Sunday), it occupies a particularly potent, and possibly volatile, degree: 28+ Gemini. You might want to notice whether any of your emotions or thoughts — or your reactions to what you’re being asked to ‘receive’ — are threatening to outpace your core values. Today’s Birthdays: George Bradshaw (1801-1853), Alexis de Tocqueville (1805-1859), Don Marquis (1878-1937), Clara Bow (1905-1965), Stanley Kunitz (1905-2006), Robert Horton (1924-2016), Harold W. Kuhn (1925-2014), Neal Doughty (1946), Leslie Easterbrook (1949), Jenny Holzer (1950), Ken Burns (1953), John Sykes (1959), Alexandra Paul (1963), Dean Haglund (1965), Adele Griffin (1970), Monica Calhoun (1971), Wil Wheaton (1972), Wanya Morris (1973), Rodney Jerkins (1977), Danger Mouse (1977), Bidisha (1978). Moon Phase: Moon is in Waxing Crescent and enters First Quarter phase on July 30 at 8:23 am PDT / 11:23 am EDT (15:23:01 UTC). Next Full Moon is in Aquarius on Aug. 7 at 11:10 am PDT / 2:10 pm EDT (18:10:33 UTC). Moon Sign: Moon is in Libra and enters Scorpio tonight at 5:23 pm PDT / 8:23 pm EDT (00:22:53 July 30 UTC). Rhiphonos enters Virgo at 3:20 am PDT / 6:20 am EDT (10:20:33 UTC). Moon enters Scorpio at 5:23 pm PDT / 8:23 pm EDT (00:22:53 July 30 UTC). Deucalion stations direct at 5:24 pm PDT / 8:24 pm EDT (00:24:34 July 30 UTC). — Juno trine Vesta at 10:10 pm July 28 PDT / 1:10 am EDT (05:09:47 UTC). — Sun square 1992 QB1 at 8:16 am PDT / 11:16 am EDT (15:15:43 UTC). — Mars opposite Crantor at 12:06 pm PDT / 3:06 pm EDT (19:05:50 UTC). 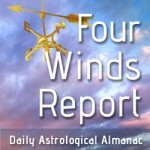 Once again, one of the outstanding astrological events of our lifetimes occurs in your sign. That would be the Great American Eclipse of Aug. 21, 2017. There’s a precedent for this: the total solar eclipse of Aug. 11, 1999. Consider what you were doing that summer, and what you were doing for the next three or so years. When you think of 1999 as a ‘before and after’ moment, what do you get? You are now standing at the threshold of another such moment. What you’ve lived through the past several years is the ‘before'; the moment you’re in is like a dimensional gate; and the future is unwritten. Take the time and the care to point your life in the direction that you want to go. This need not take longer than a few moments, though deep meditation and grounded decisions usually require more investment of thought. Remove the no-longer-valid priorities from your agenda; decide what no longer serves you. Then, search your soul and remind yourself what you simply must do. Be exceedingly honest with yourself about this, and don’t be distracted by whether you think something is or is not possible. You might know what this agenda is without even thinking about it. Use the power of your mind and point your existence in that direction. Then, steady as she goes. As the year progresses, you will come into your own. This may not happen today or tomorrow, though all the signs are there. Don’t be daunted by the insecurities of others. You must use any friction as a source of power. If you find yourself in a conflict, use it as a way to map out where people are coming from, and get the upper hand. As Venus nears its square to Chiron (exact Sunday), it occupies a particularly potent, and possibly volatile, degree: 28+ Gemini. You might want to notice whether any of your emotions or thoughts — or your reactions to what you’re being asked to ‘receive’ — are threatening to outpace your core values. The level of personality has a way of buffeting us when we stay at a surface level; if you’re feeling stress, Chiron in Pisces seems to suggest that diving to deeper water might take you beneath the layer where the wind whips up the waves. If it feels more like immersion into a new level of understanding rather than evasion, you know you’re on the right track. This is a seminal year for Leo Sun, rising and Moon, with two New Moons in your sign, the second one a potent solar eclipse. All the more reason to take hold of the reins and steer this dynamic energy in the direction that works for you. 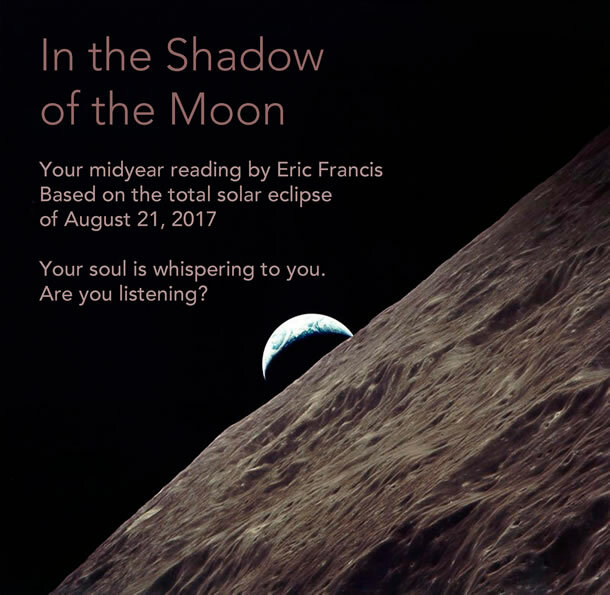 Your 2017-18 Leo Birthday Reading by Eric Francis will be exactly the support you need to navigate through these exciting transits. 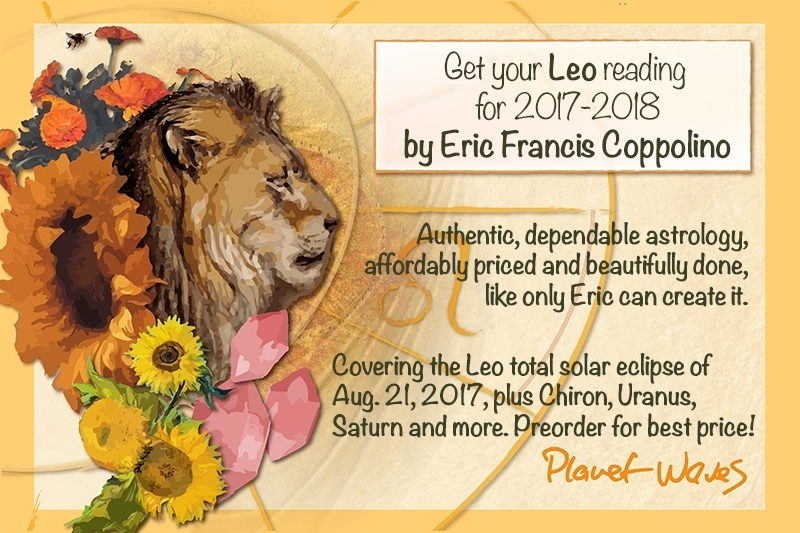 It’s now available for pre-order at the lowest price of just $33, so be sure to grab a copy — whether for yourself or the Leo you love — before that increases.